Edward Weston’s Mexican years were of great importance to him and allowed for the maturing of his vision in relation to photography. 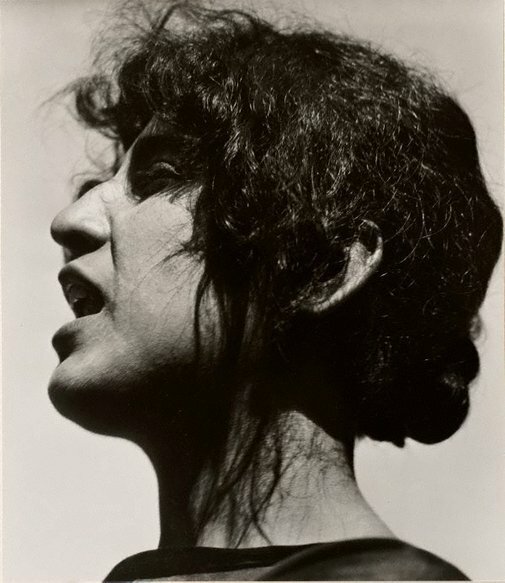 Accompanied by Tina Modotti, whose own work developed at this time, Weston experimented with pure form through monumental portraits (of which ‘Guadalupe de Rivera, Mexico’ is a classic example), images of landscapes and buildings, still-lifes and nudes. Weston’s portraits of those he encountered in Mexico are uniformly compelling. Often taken with a hand-held camera against a plain background and with strong lighting, these images emphasise individuality, modernity and dynamism. This later print by Weston emphasises, through the dramatic effect of light and shade, the strong lines of the face. The shape of the open mouth is echoed by the shadowed eye above and the jawline below. The diagonal of jaw to ear which runs in parallel to the nose also adds to the dynamism of this image. Outdoors, with the sun shining on her hair, this is a portrait of a remarkable woman. Signed and dated l.r. original card, pencil "EW 1924" and c. verso original card, pencil ".../... 1924/ Edward Weston". Judy Annear, Photography: Art Gallery of New South Wales Collection , 'The photograph and portraiture', pg.15-31, Sydney, 2007, 28 (illus.). Artweek , California, 29 Nov 1986, 5 (illus. ).